The patented Olds Elevator is a new alternative to bucket elevators and expensive pneumatic conveyors. It is manufactured in the USA and overseas and is used in a wide range of powder and bulk material applications. Olds Elevator utilizes a static screw and a rotating casing to vertically elevate foundry sand, hot ceramics, grain, gypsum powder, sugar and many other industrial materials. The self feeding intake delivers material inside where it is gently elevated by rotating casing. 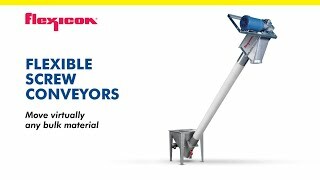 Olds Elevators operate are used with explosive materials in fully-flooded mode and with abrasive materials that wear through other conveyors. Olds Elevators are volumetric and deliver material at any rotational speed above zero RPM. Olds offers material testing, engineering and support services.